(New York) – The government of Bangladesh should stop forcibly returning ethnic Rohingya fleeing sectarian violence back to Burma. At least 18 Rohingya asylum seekers, including three young children, are in immediate danger of being forcibly returned to Burma on World Refugee Day, June 20. 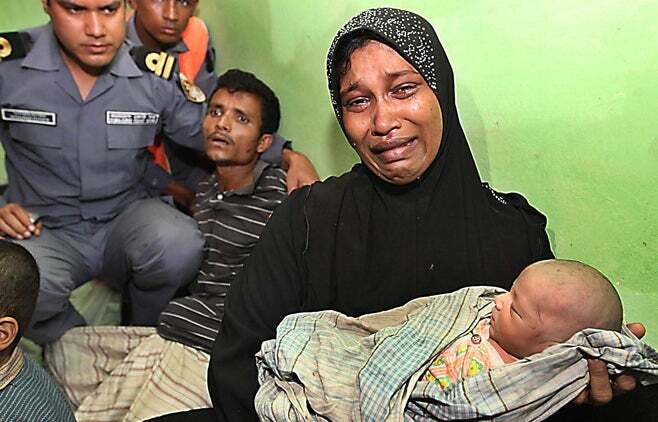 A distraught Burmese refugee, her husband in the background, cradles her newborn baby in the custody of the Bangladesh Coastguard in Shah Porir Dweep, Bangladesh on June 18, 2012. The coastguard says it will deport the family when the weather improves. Human Rights Watch urged the Bangladeshi government to provide Rohingya fleeing Burma humanitarian assistance and at least temporary refuge until it is safe for them to return home. Bangladesh border officials are denying boatloads of Burmese refugees entry to Bangladesh at the port town of Shah Porir Dweep, Bangladesh on June 18, 2012. On June 18, Human Rights Watch witnessed the Bangladeshi coast guard push nine boats reportedly holding more than 140 Rohingya back to Burmese waters from the jetty in the port town of Shah Porir Dweep. Push-backs on June 19 were postponed because of inclement weather. Bangladeshi border guards and police have also arrested and deported an unknown number of Rohingya who have recently entered Bangladesh. The Bangladeshi authorities insist on pushing back asylum seekers seeking sanctuary across the border in violation of international law. Bangladesh should abide by its obligations under international law not to return Rohingya fleeing violence in Burma, Human Rights Watch said. At least 18 asylum seekers are at immediate risk of forced return and others face return in the future. This number includes a family of five, including three children, in the custody of the Bangladesh coastguard. One of the children is a newborn boy named Sangram (meaning “struggle”) who was born on or around June 13 on St Martin’s island in Bangladesh after the family was detained. 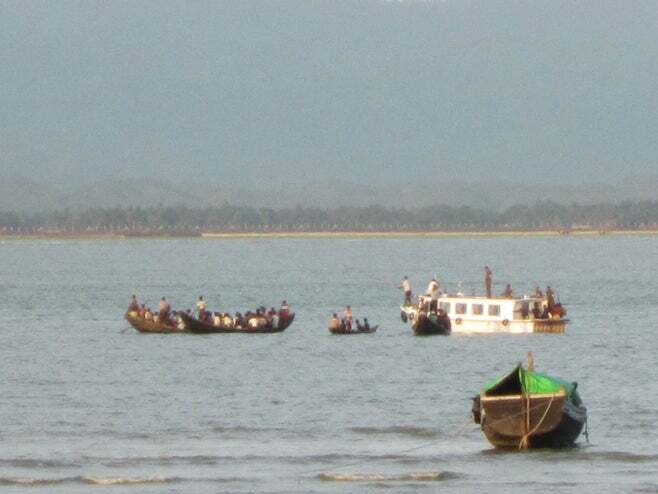 The family had reportedly fled Sittwe, capital of Arakan state in Burma. Others who arrived on the same boat have already been sent back to Burma. At least 13 others are currently believed to be in the custody of Border Guard Bangladesh. While Bangladesh is not a party to the 1951 Refugee Convention or its 1967 Protocol, it is a party to other treaties – including the Convention against Torture, the International Covenant on Civil and Political Rights, and the Convention on the Rights of the Child – that provide protections to refugees and asylum seekers. These treaties and customary international law establish the obligation of states to respect the principle of nonrefoulement, which holds that refugees should not be forcibly returned to a place where their lives or freedom would be threatened and that no person should be returned to a place where they would be subjected to torture. Article 3 of the Convention against Torture prohibits the return or expulsion of any persons to states where they would be in danger of being tortured. The Committee on the Rights of the Child has stated that states must not return a child to a country where there are substantial grounds for believing that there is real risk of irreparable harm to the child. Human Rights Watch repeated its call to the Bangladeshi government to allow independent humanitarian agencies free and unfettered access to the border areas. Other governments should provide humanitarian assistance and other support for the refugees and press the Burmese government to find a durable solution by resolving Rohingya citizenship. The Rohingya are not recognized as citizens of Burma, and have long been persecuted and discriminated against by the Burmese government. Brutal violence in Arakan State between Buddhists and Muslims erupted on June 3 and has intensified since then. Security forces have shot and killed an unknown number of Rohingya, and sectarian mobs from both groups have burned down the homes and businesses of the other. On June 10, Burmese President Thein Sein issued a state of emergency in the area, ceding authority for law enforcement to the Burmese army. For decades, the Rohingya have routinely suffered abuses by Burmese security forces, including extrajudicial killings, forced labor, land confiscation, and restricted freedom of movement. “We are deeply concerned given past practices of the Burmese security forces that people in Arakan state, especially Rohingya, are at risk of serious rights abuses,” Frelick said.